Imogen's Typewriter. : Barbara Nadel: Research Trip on a Budget! I love travel, and I love when books take me away to places that I've never visited. 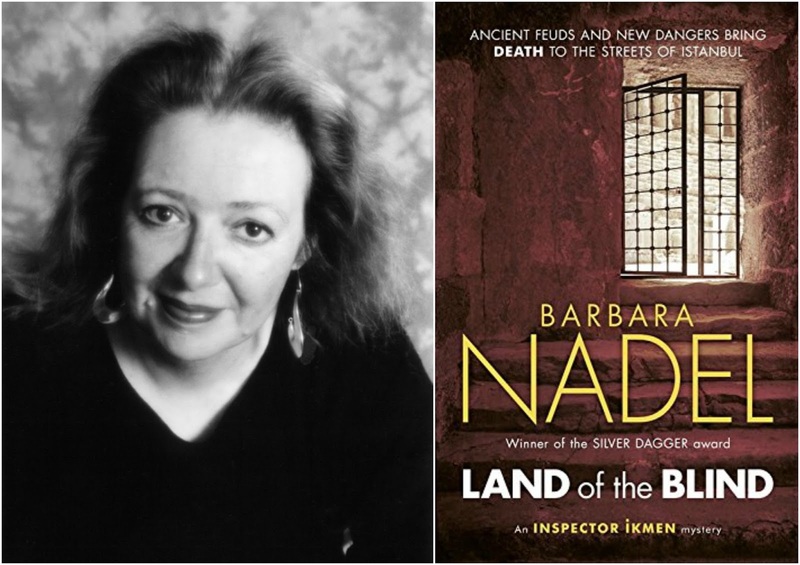 Barbara Nadel writes detective novels based in Istanbul and she's here today to talk about her last research trip and her experience travelling on a budget. Her new book is Land of the Blind, the 17th Inspector Ikmen mystery! Every so often my life falls apart. It’s nothing to worry about, that’s just the way that it is. I’m accustomed to frequent upheavals and so it’s probably better that they happen to me rather than to someone who is used to a more even keel. So it was last year, we hit the financial rocks again just as I was planning my next research trip to Istanbul. I’m always budget conscious when it comes to flights and so I will often fly at bizarre times to save a few pounds. My flights were fine. I frequently stay with friends and so accommodation is generally taken care of too. But this time I had to find a place to stay and pay for it. It was then that I discovered that even my usual haunts were now beyond my etiolated pocket. So I picked a cheap place that was in an area I know and crossed my fingers. My arrival at the Hotel Blah (name changed to protect the guilty) was hardly auspicious. The man in front of me in the immigration queue at Ataturk Airport fell to the ground fitting and, despite the best efforts of a nurse, died in front of me. Now I’ve worked in a hospital and so I’ve seen death before. But this was death of a sudden, out of context nature and was a deeply distressing incident all round mainly because the poor man’s wife could speak neither Turkish nor English. So no one could communicate with her. She just howled. I arrived at my hotel in a bit of a state. Luckily for me a friend was there to meet me and whisked me off to a local restaurant for many calming cups of tea. Only when I returned to the hotel later that night did I realise that it was semi derelict. There was a vast hole in the wall beside the staircase which allowed for excellent views of the house next door and was a wonderful source of draughts. But I was tired and skint and so what the hell? My room, which was basic Turkey circa 1978 was comfortable and clean. It was a pity that the sexual athlete next door, an imposing Russian man, was so noisy in his congress with several women but I assumed he wouldn’t be doing that every night. And so day dawned on a creature more zombie than human which I attempted to revive with a bit of breakfast in the breakfast room or garden shed out the back. It had a wonderful view of the Sea of Marmara and the food was good enough to set me up for a day of relentless walking. I needed to visit a cemetery in one of the northern suburbs of the city and had decided that, rather than use up valuable cash on my Istanbul Kart travel pass, I’d use my legs. They didn’t like it, my legs. Six miles on a right leg held together by plates and pins that stick in your flesh when you exert yourself too much isn’t a whole load of fun. I had to get the metro back after limping around cemeteries talking to cats and finding some very disturbing statuary. Night-time in the hotel was once again a lively Russian themed event so, again, it was a good job I was knackered. The other problem was food. Breakfast was taken care of, now in the company of many large women from somewhere in the Balkans, all very jolly. But what of the rest of the day? When you’re really skint you eat weird stuff. If you’re at home you can cobble together a meal from a load of old lentils and tomatoes. But out in the ‘wild’ you have to graze where you can. So it was things like a cup of coffee with a complimentary biscuit, chocolate bars and a plate of rice with some veg. Long gone are the days when I could get a man to buy me a meal. The amount of scaffolding and paint needed to hold my face up and make it respectable looking do not exist in this galaxy. But I did have a very nice cuppa with a priest and a lovely meal, at the end of my stay, with friends. The Russian next door was on a sexual roll for all of that week. But human beings are adaptable and so I learned how to drop off to the sound of multiple orgasms. As I checked out, the police arrived to shut the place down which was a shame. Cheap, clearly doubling as a knocking shop (for those who don’t speak East End this is a brothel) it was clean, if cold and when you returned at night you did feel a bit like you were living in some sort of espionage novel. Did I mention that you had to knock and then show you face to get in? You did, it was wonderful. Thank you to Barbara for this post! It sounds like it was a very interesting trip. Land of the Blind is available now here!